When our son was just about to turn four, he was ready to graduate from his toddler bed to something larger. His room at the time was very small, so I wanted to come up with something that would maximize the available space, fit a twin size mattress, and double as a play area. 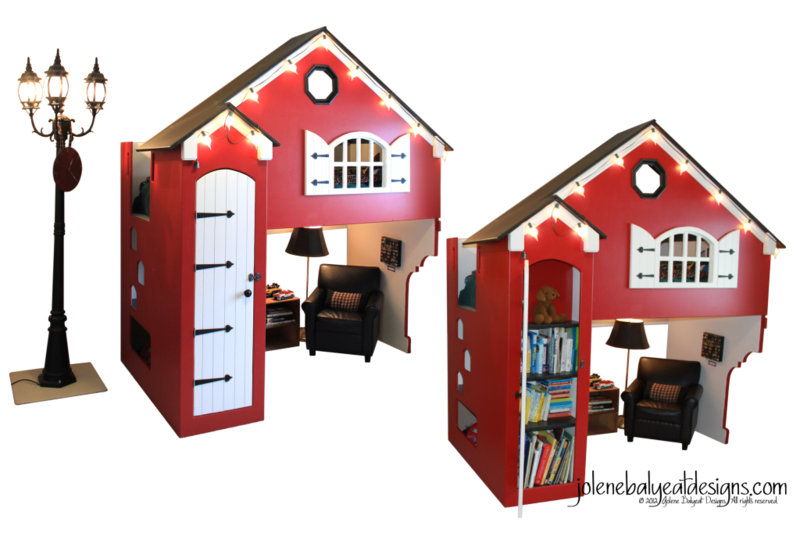 When I discovered the company Tanglewood Design, I was thrilled to learn that in addition to selling kits, and ready made beds, they also sold the plans for the DIY family to customize and create their own masterpiece. I absolutely fell in love with their philosophy and designs, plus they were personable and helpful as well, so I highly recommend them! My husband agreed to take on the building project. In his spare time over the next few weeks he borrowed a friend’s wood-shop and tools. When he was done cutting out the pieces, he rented a truck and brought them home for me to paint. 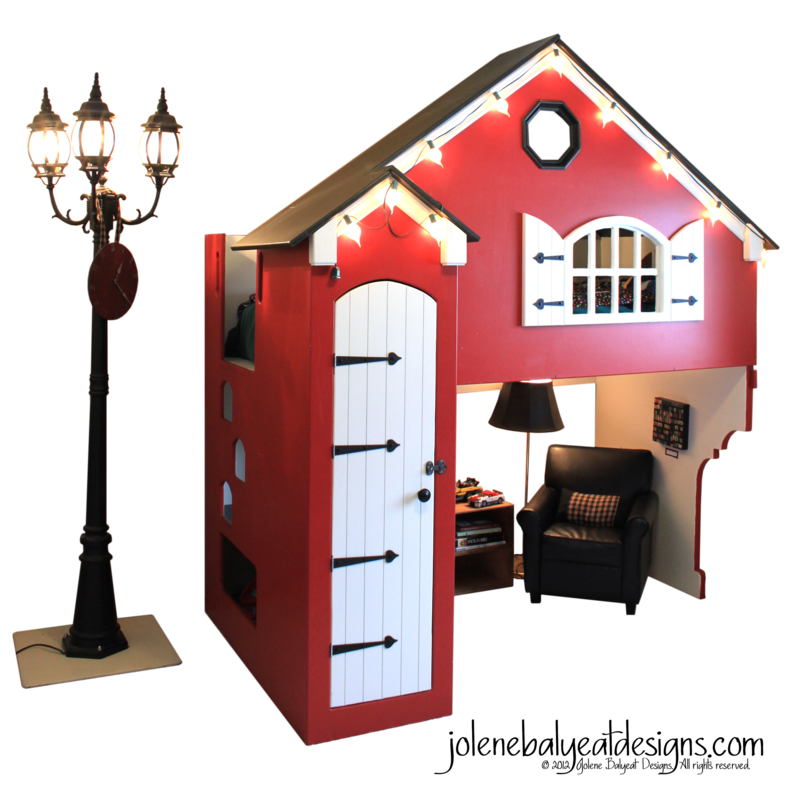 My original idea was to make a giant tree for the corner of the room, with a rounded door in the trunk, so that our son could go into the trunk to climb into his bed. I wanted LED lights to hang in branches over the roof line to twinkle as a nightlight, but I couldn’t find a tutorial anywhere to create such a thing, and as our budget and space were limited, that part didn’t come to fruition. However, months later, I stumbled on an article that featured just such a tree (albeit in a beautiful fairy tale girl’s room) designed by Kidtropolis. Feel free to check out their link so that you can imagine the complete concept! Below is a view of the inside of the bed where our son sleeps. 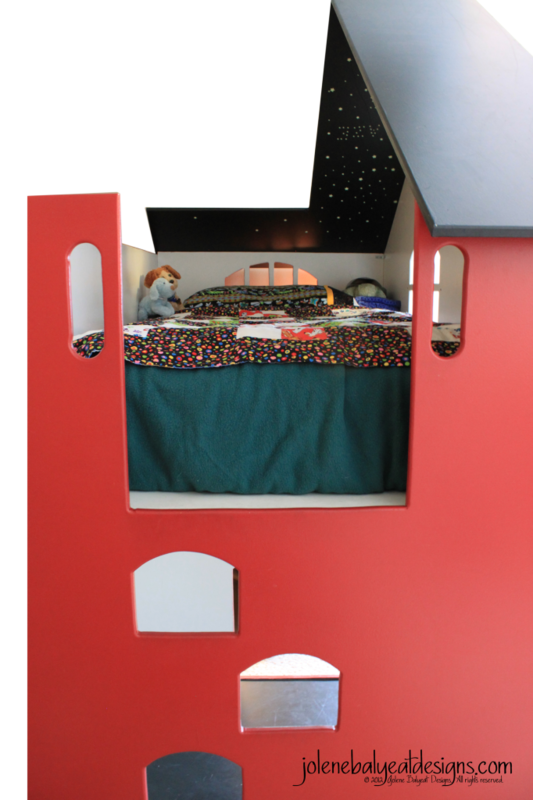 The brilliant part about this design is that the space under the bed is big enough for a double mattress, if a family has more than one child or prefers a bunk bed option. We elected to stage it as a little man cave, and set it up like a miniature living room. We added a door (not in the original design) so that we could close in the bookshelves, and keep the space from looking cluttered. Instead of a tree, in keeping with the play house theme, we had a steel plate made for an exterior park light (so that it can’t tip over). Our son still absolutely loves his bed. I never tire of hearing him tell someone he meets for the first time, “I have a house bed that my dad and mom made…and I got to help!” My husband and I joke that we always wanted to build a house together someday. Now we can cross it off our “bucket list”. This entry was posted in Uncategorized by jolenebalyeat. Bookmark the permalink.